The Muppets is slowly becoming one of my favorite prime time television shows. That the show is trying to retain the personalities Jim Henson gave each character is endearing to the child in me that grew up on Muppet movies such as The Muppet Movie, Muppet Treasure Island and The Muppet Christmas Carol. For example, Kermit is kind but naive, oftentimes his naïveté gets him in trouble. Fozzy is a silly bear that just can't get a joke right. And Gonzo is, well, a whatever. The show may also be accomplishing something Henson strived for his whole life: his puppets being taken seriously by adult viewers. Oftentimes the Muppet movies and TV show go either way; the combination of child friendly with a touch of adult humor has always been a trademark of the Muppets, but has not always been done right. Case and point: Kermit and Piggy's often abusive relationship. Although slap stick funny, because they are flailing puppets, the situation redeems itself only when Kermit eventually has to try to console the distraught Piggy. Personally speaking, this leads to mixed feelings about whether I am watching a silly kid's show or a social commentary on abusive relationships. Further, I can understand why parent associations are annoyed that The Muppets are becoming more mature and sexually aware; the "Rainbow Connection" definitely made me feel special as a kid. What most parent associations fail to acknowledge is that Henson did not want his puppets solely in children's entertainment. If you look up Jim Henson's biography, he wanted to use his puppets for adult themed shows and movies that he was never allowed to do. According to Internet Movie Database, Henson was typecast as a children's entertainer after allowing his puppets to be used in the educational television show Sesame Street when it first broadcast in 1969. He tried to incorporate his Muppets in more adult-centric television shows by joining the original cast of Saturday Night Live in 1975. However, his humor and his Muppets were misunderstood. Henson kept moving forward, eventually creating The Muppet Show and other prominent puppet movies, such as The Muppet Movie. However, his Muppets would then on be seen as characters for children's television shows and movies. 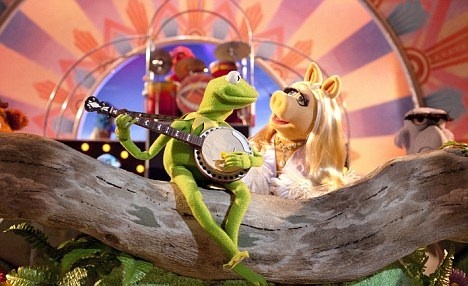 The Muppets TV show may be Henson's dream come true. The layout of the show helps determine that although puppets are the main characters, this is not children's television. The show is filmed similarly to The Office, with personal interviews of the muppets occurring sporadically throughout an episode. What really makes the show adult-themed is the social commentary, often illegal antics, and drug references, all made in good taste. The Muppets are still the same old goofy, wishful dreamers, but much more self aware. I perceive this as a good thing, as I sincerely hope this is what Henson would have wanted for his creations. In fact, Piggy and Kermit may even have a chance of changing their relationship for the better, now that there is room for adult discussion.